The Arava Institute and Aston University recently received the 2017 Sustainable Water Industry Group (SWIG) Award for their joint project on “Off-grid desalination for irrigation in the Jordan Valley”. The SWIG award celebrates achievements in the sustainable water industry, in order to increase awareness of what can be achieved, and inspire future projects and transformational change. 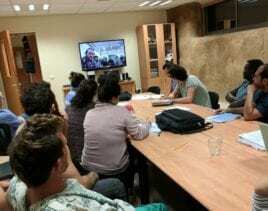 The project, which was initiated in the summer of 2017, brings together a team of students from the Arava Institute and Aston University to resolve important issues of water supply to Palestinian farmers in the Jordan Valley, where underground water has become very saline and unsuitable for irrigation. As the Fall 2017 semester comes to an end, the first group of students is completing the unique “Off-grid Desalination Development, Design and Management” course, which was held cooperatively between the two institutions via weekly video-conferencing. Three Arava Institute students, Jordanian, Palestinian and Israeli, will be participating in an internship at Aston University in January to work on advancing applicable community irrigation projects with their colleagues there. They will return to the Institute in the Spring semester to lead the work on the projects’ applications in the field.